Business Excellence builds on two different kinds of excellence: Professional Business Excellence and General Business Excellence (GBE). Professional Business Excellence implies that you know the business you are in and you realise what it takes to excel in that particular business – as a minimum. General Business Excellence implies that you know what it takes to be successful in any business in addition to your professional business competence. In all businesses, you have to manage productivity, relationships, quality and you have to apply appropriate management and leadership principles. And you have to do these four things at the three levels: company, team and personal level. Hence, there are the 12 windows (4 main areas x 3 levels) in the GBE model. This model represents what any company, in any business, in any sector, in any culture, and at any time must focus on to excel. This table is your site map. 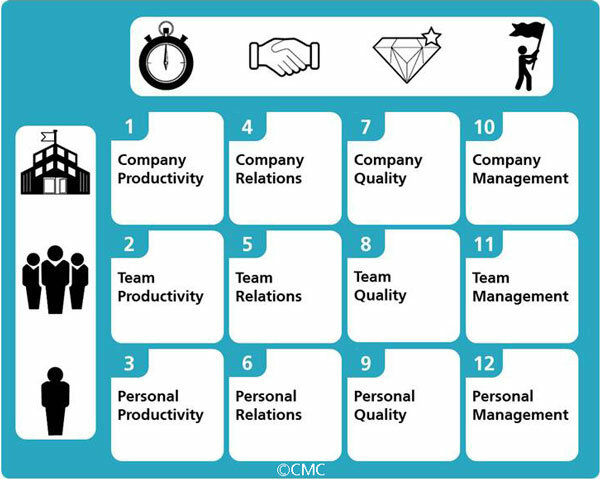 Click one of the four areas in the 12 windows model to learn more about Productivity, Relationships, Quality and Management/Leadership. Productivity Business Excellence: Adding value and ensuring productivity by managing time, knowledge and money. Relationship Business Excellence: Building and maintaining good relationships with all stakeholders. Quality Business Excellence: Creating and maintaining quality and meeting/exceeding demands and expectations from internal and external customers. Leadership Excellence: Performing managerial behaviour and establishing an Employeeship culture, characterised by commitment, responsibility, loyalty, initiative and positive energy.